Europe Anaerobic Digestion Market size for 2016 was valued over USD 3 billion and the annual installation is predicted to exceed 2 GW by 2024. Strict regulations to treat waste and residues with minimal environmental impacts and growing measures to maintain energy security will drive the anaerobic digestion market size. Rapid urbanization along with increase in residential, commercial, and industrial waste will positively impact the business growth. In 2015, as per the World Bank, high income group accounted for 1,649,546 municipal solid waste generation daily and is estimated to reach 1,879,590 tons/day by 2025. Rising focus toward sustainable energy coupled with measures to reduce greenhouse gas emissions will fuel the anaerobic digestion market share. Cost competitiveness when compared with available counterparts and product ability to produce gas, heat, and electricity simultaneously will further embellish the industry growth. In 2016, the European Commission revised its energy efficiency target to 30% from 20% for 2030. Ongoing government initiatives to encourage the adoption of bioenergy along with rapid industrialization will stimulate the anaerobic digestion market size. Feed in tariff, tax rebates, and financial assistance are some of the incentives supporting deployment of AD technology. The Government of UK has introduced various incentives, non-domestic Renewable Heat Incentive (RHI), Road Transport Fuel Certificates (RTFCs) to encourage the product adoption. Agriculture anaerobic digestion market size will exceed 800 MW by 2024. Low emission rate, high operational performance, and affordable price make its adoption preferable over other available alternatives. As per Green Investment Bank, operational performance of plant fueled with agricultural waste in UK has increased from 63% in 2013 to 71% in 2015. Growing consumer awareness toward waste management along with limited land availability for landfills and dumps will positively influence the municipal anaerobic digestion market. Increasing recycling needs and rapid urbanization are some of the key factors which will stimulate the product demand. In 2015, European Commission introduced target to recycle 60% of the municipal waste by 2025. Industrial anaerobic digestion market is set to witness gain over 10% by 2024. Stringent government norms toward industrial waste to diminish land and water pollution will augment the industry growth. The European Union introduced the Directive 2000/76/EC with an aim to limit the adverse effects of the incineration of waste. The directive sets emission limit values for co-incineration & waste incineration plants and imposes technical & operational requirements within the member states. Residential anaerobic digestion market share is predicted to witness growth over 12% by 2024. Growing adoption of biogas for cooking and electricity applications will embellish the business growth. According to the World Health Organization in 2016, around 3 billion people use solid fuels including crop wastes, coal, dung, wood, and charcoal in open fires to cook and heat their residences. Ongoing development across government buildings, hospitals and supermarkets will propel the commercial anaerobic digestion market. In 2016, France implemented ban on unsold food from supermarkets and restaurants through prohibiting disposition of organics including food scraps in landfills. 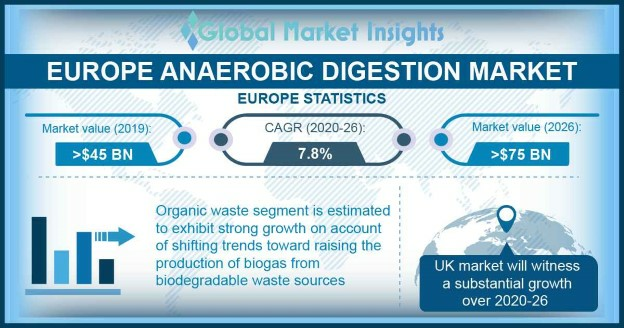 The UK anaerobic digestion market is predicted to witness strong growth pertaining to appreciable development of small-scale biomass renewable energy. Department of Energy and Climate Change, Defra, and AD Strategy and Action Plan are working to foster the deployment of anaerobic digestion across the nation. In 2017, Office of Gas and Electricity Markets announced to reduce a specific payment to small-scale biomass generators including embedded generators with less than 100 MW capacity. Rising concern to maintain fossil fuel sustainability along with growing energy demand will propel the Germany anaerobic digestion market. Restricted landfilling and ample amount of waste are some of the factors which will propel the business growth. By the end of 2016, more than 9,000 biogas plants were operational in country most of which are located on farms. 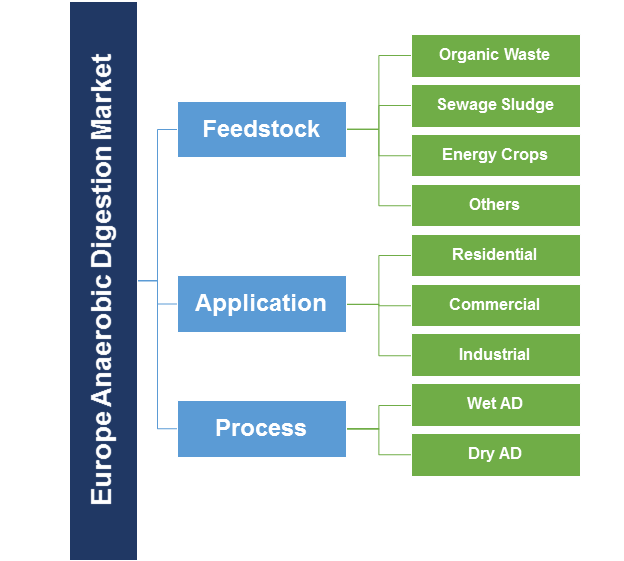 Key participants in anaerobic digestion market includes Tamar Energy, BTS Biogas, Weltec, Biogen, AD4Energy, Clarke Energy, Biogen, EnviTec, Blue Sphere, CH4 Biogas, Clarke Energy, PlanET Biogas, Veolia, Xergi A/S, SEaB Energy, Stream BioEnergy. Industry players as a part of strategy are focusing toward mergers & acquisitions to gain competitive edge and expand regional presence. In July 2014, General Electric has acquired Monsal, one of the leading AD specialist to enhance its renewable energy offering. Anaerobic Digestion is an efficient and clean technology to produce electricity and biogas. Its lower operating cost and greater efficiency compare to other bioenergy technology makes its adoption favorable over other available alternatives. It can use a variety of feedstock including agriculture, municipal, industrial waste. AD systems find its wide application in industrial, commercial, and residential sector.